Many talented artists make the Moapa Valley their home. 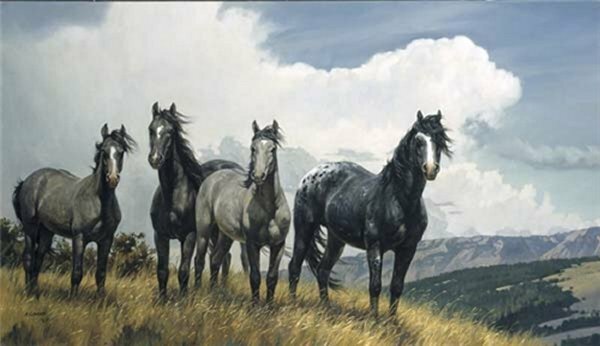 Nancy Glazier, a renown wildlife artist has honored us by placing her accomplished work here. Joan Rainey Day, Jana Ward, Janet Trobough, all well known established artists in the Southwest, are resident at the gallery. Gifted teenage artists, Nephi Boren, Alec Stump and Naomi Nichols all have generated great interest in and sales of their work. Ron Casey prepared this short video featuring his current show at the gallery. His work is an example of the diversity of artwork you'll find here. As you watch Ron's presentation and see his work, notice the variety of mediums our various artists have created and are displayed throughout the gallery. Wild Horse Gallery came about out of a desire to revitalize a community. . Located in Overton, at the northern gateway to Lake Mead and the Valley of Fire in southern Nevada, the area's economy is tied to tourism. Mary Kaye Washburn's article to the local paper, spearheaded a project to revitalize the community by giving a face-lift to the down town area, making it desirable for tourists to stop, and to encourage new business. Inspired to set an example, she and her daughter, Shelly Benkman, opened the gallery. Since opening their doors in March of 2013, six other businesses have followed suit. Overton now has a flower and gift shop, an ATV sales and service dealership, 2 beauty salons/spa/boutique, a skin care salon and a new pizza parlor!